1. The Russian State Public Historical Library’s collection of 145 Russian Futurist books. Includes works by Burliuk, Goncharova, Kamensky, Kruchnykh, Mayakovsky, Khlebnikov and others. More Russian avant-garde books are available from the Getty Museum’s web page for the 2009 exhibition Tango with Cows. 2. Russians without Russia: press archive of emigré journals. 21 stunning emigré journals in excellent reproductions, downloadable as single pages. 3. 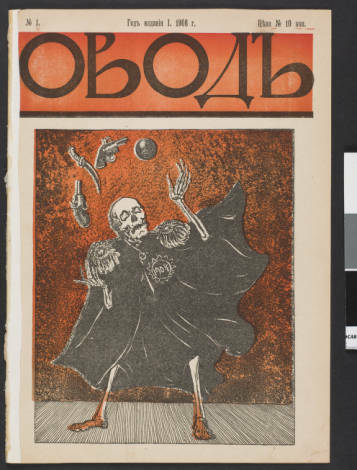 Russian political satire at the Digital Public Library of America. Some fabulous titles here, collated from various collections. It’s not immediately obvious how to get to the full content, but if you click on the image, then on the eye icon, you’ll be transferred to the appropriate page. 4. It’s not remotely in the same league as the others visually, but SovLit’s list of early Soviet journals has much to recommend it, not least the full text (and in plain text – joy!) of a number of titles, including Novyi LEF (New LEF) and Kuznitsa (The Forge). The image is taken from the front cover of Ovod (The Gadfly), 1 (1906), from the library of the University of South California. It is reproduced under the terms of a Creative Commons Attribution-NonCommercial-ShareAlike 2.5 licence. As impressed as I am with russians without russia, I continue to wish they, or someone, would put online the entire run of Sovremennye zapiski, far and away the most important emigré journal. I’d trade everything else they have online for it.